Three major trends have emerged for organizations to efficiently gain access to and optimize work with their most valuable data. First, streaming data architectures, enabled by change data capture (CDC) technology. Second, enterprise data lake acceptance to deliver a single repository of enterprise data for self-service data and analytics, and third, cloud computing adoption, which delivers the simplicity and affordable scalability of data storage and usage for massive quantities of data ingested. This technical whitepaper by Radiant Advisors covers key findings from their work with a network of Fortune 1000 companies and clients from various industries, to assess these trends. The research includes distilling real-world examples into patterns for success in modern data integration, designed to help enterprises understand how to maximize the use of streaming data. 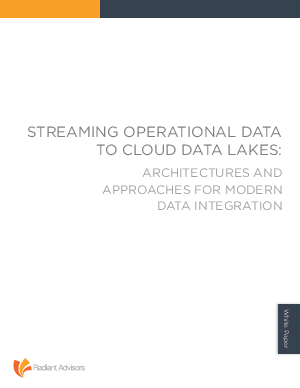 Accordingly, this paper also clarifies the importance and value of populating a cloud data lake with streaming operational data, leveraging database replication and modern data integration techniques. Download this whitepaper to learn more about modern architectures and approaches for streaming data integration.